The R755 near Laragh in Wicklow. A MAN IN his 30s has died after his motorbike collided with a 4×4 vehicle near Laragh in Co Wicklow this afternoon. It happened on the R755 Laragh to Annamoe Road at around 12.30pm. The motorcyclist was pronounced dead at the scene, gardaí said in a statement. His body has been removed to St Columcille’s Hospital in Loughlinstown. The driver of the 4×4 was uninjured. 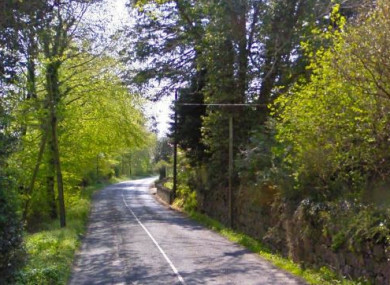 “This stretch of road is currently closed to facilitate an examination by Garda Forensic Collision Investigators and local diversions are in place,” gardaí said. Anyone who witnessed the crash is being asked to contact Wicklow Garda Station on 0404 60140, the Garda Confidential Telephone Line on 1800 666 111 or any Garda station. Email “Man killed after motorbike collides with 4x4 vehicle near Laragh ”. Feedback on “Man killed after motorbike collides with 4x4 vehicle near Laragh ”.